Folks, I have fallen in love all over again and it’s not with my Hubby this time (though I always do) but, seriously. I am head over heels over my SodaStream Source and ever since I cracked it open, I haven’t stopped making sparkling drinks MY way. If you’ve never heard of SodaStream, well, you’ve been missing out. SodaStream is a cost-effective, eco-friendly, healthier and smarter option to other sparkling drinks on the market. It is extremely easy and you can make up to 3 bottles in 5 minutes. As a family, we try to take steps towards living a greener life every day. We NEVER litter, we try to reuse and re-love many things in our lives by donating or renovating and now with SodaStream, we are reducing waste with every single use. I know I am not alone with my pining and admiration of beautiful appliances, right? Right? Well, anyone can admit that this is a beaut and I love it in Red. It comes in White, Black, Blue and Red, in case you were wondering. Less lugging, storing and disposing of bottles or cans – 1 bottle of SodaStream can replace 2000 bottles and cans. Turns water into sparkling drinks in seconds. Yes, just WATER turned into bubbly goodness. Over 30 delicious flavors to choose from – SodaStream flavors contain fewer calories, sugar, and carbs than traditional sparkling beverages. That right there is something that I can get behind because taking in fewer cals, sugar, and carbs is a huge plus for my family. That and the fact that you can truly get creative when you make your own sparkling drinks. It’s YOUR drink, YOUR way. Gabby is just as obsessed at making sparking, fizzy and bubbly drinks as I am. She shows you how it works, what she loves about it and her reaction to trying the Ocean Spray Grape Cranberry. 1. Your drink, your way: YOU choose what goes into every drink – more or less bubbles, really sweet or just a spritz of sweetness. 2. Healthier: Their syrups have 2/3 less sugar and calories and fewer carbs than store-bought brands. I prefer the Diet syrups and they do NOT contain High Fructose Corn Syrup, which is so important to me. 3. Environment: 1 SodaStream bottle can replace 2000 bottles and cans. Almost one billion bottles are produced each day of which 800 million ends up in landfills. Helping the planet in any way, big or small is a big deal to me. I love that I am reducing cans and bottles simply by using my SodaStream Source. This is my drink, my way. Picture a hot, steamy summer afternoon or better yet, any given evening when you’re settling down. Heck, any time is good. I love me a good sparkling drink, any day. But, it’s even more exciting when I can make it just how I like it. Here’s how I chose the Ocean Spray Cranberry Raspberry and some fresh ingredients to make a fizzy, refreshing and delicious drink that the whole family can enjoy! Follow the steps you need to turn your water into a bubbly beverage. I use filtered water and make it as cold as it can go. Take about 1/2 cap of the SodaStream Ocean Spray Cranberry Raspberry mix and add it slowly into the bottle. Make sure to go bit by bit or you may have a fizzy overload on your hands. Add Fresh Fruit and Mint. Let it settle and then add fresh raspberries and leaves of mint. Let it fizz, let it infuse and enjoy. We try to teach our kids the benefits of sustainability. We used mint from our little herb indoor herb garden and organic raspberries. With Earth Day coming up on April 22nd, it’s so important to teach our kids the impact that we have on the planet and what we can do to minimize our carbon foot prints. I can totally see me serving this fizzy beverage on hot summer days and making quite a few bottles to boot. Making a delicious, sparkling beverage is easy as that. In minutes, you’ll have a sparkling drink that everyone will love. And no, it’s not store-bought and say goodbye to those cans and plastic bottles. 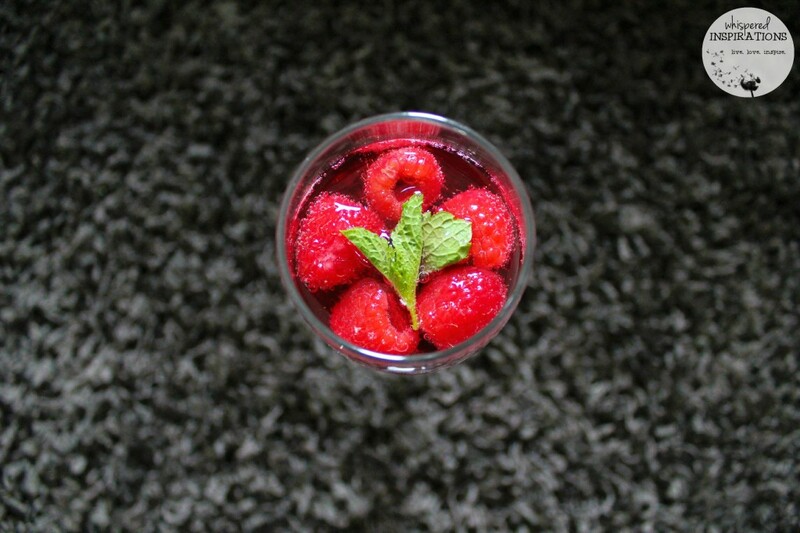 An invigorating, bubbly drink infused with fresh fruit and mint. Fresh mint leaves to taste. Fill SodaStream bottle to water fill line. Push down on the machine and pump until you reach full carbonation. You want it extra fizzy. Add 1/2 cap of SodaStream Ocean Spray Cranberry Raspberry mix, do it slowly or it will overflow. 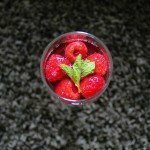 Add raspberries and mint to taste. I settled in on the couch, opened the windows during the evening and sipped away. It was refreshing and even though it had mint, the kids loved it. They felt all fancy because they drank it out of wine glasses. I can’t wait to use my SodaStream Source to make even more fruit infused concoctions and our favorite sodas. One of my bloggy friends Angie, suggested that it’s perfect for upset tummies too because you can make Ginger Ale and not have to run out to the store. Genius! The SodaStream is perfect all year-round but, especially during the summer. Since it is portable, you can bring it outdoors. 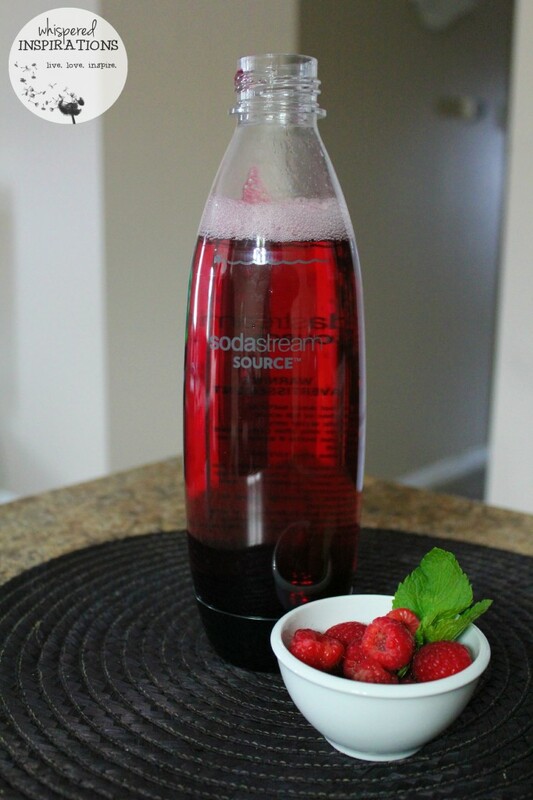 See how we enjoy our summer with SodaStream, here. If you want to connect with SodaStream or get some recipe inspiration, check out @SodaStreamCanada on IG, @SodaStream_ca on Twitter and SodaStream Canada on FB. They’ll love to hear from you! So, how do you and your family try to live healthier and more eco-friendly lives? Note: I am part of the PTPA Brand Ambassador Program with SodaStream Canada and I received compensation as part of my affiliation with this group. The opinions on this blog are my own. We grow our vegetables and plant flower gardens. I would love to try this out, my husband was actually just talking about these the other day! He has a good eye! We have a balcony garden where we can grow some fresh herbs and veggies and we make sure we recycle everything that can be recycled. We always recycle, grow our own veggies and are conscious of our electricity usage. Thank you for noting how green this product is. I consider myself Earth-conscious, and really appreciate products that consider the welfare of our environment. these sounds awesome, I so want to get one for my husband. He is a sodaholic! I am going to enter this giveaway and cross my fingers! 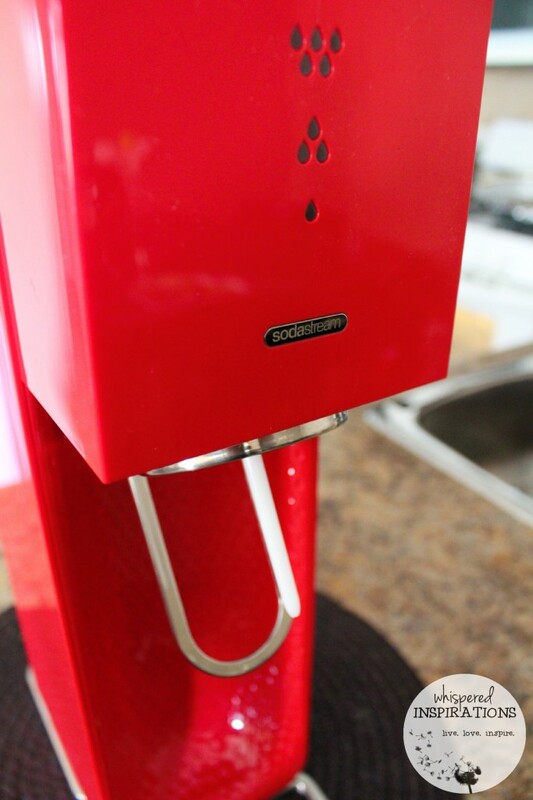 I love the red SodaStream! I think it's great it makes the Cranberry drinks. I love those. Great blog! We make sure to eat locally sourced veggies, and plant a garden on the balcony. We also break down our recycling and make sure it is compact and sorted as best we can. 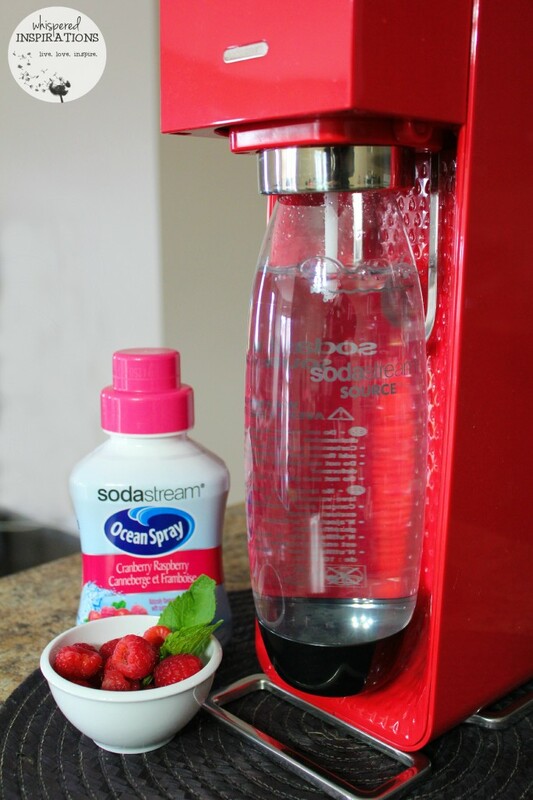 love, love, love Sodastream! I've had a stab at it and it's sooo cool and a healthy alternative to regular soda. 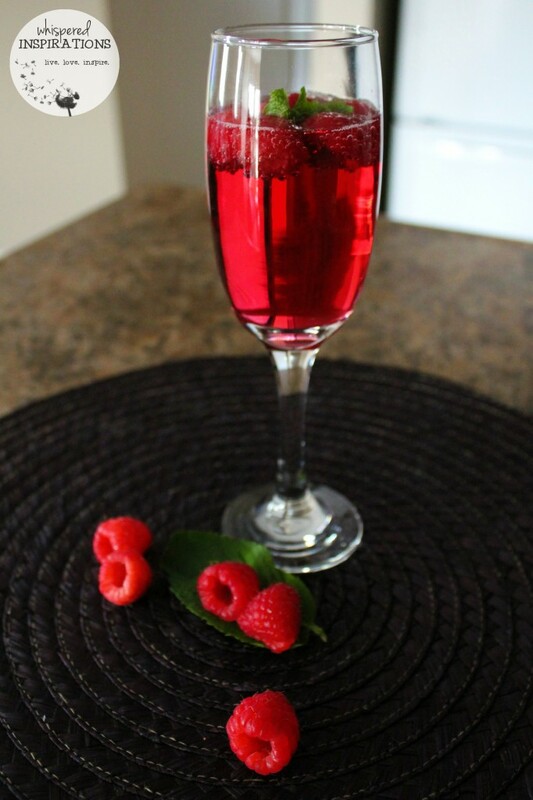 We love all of the bubbly beverages we have made so far, no disappointments at all. We use a Soda Stream and love it. Not only is it eco-friendy compared to all of the bottle we were going through before, but it also gives us more flexibility and variety without taking much space. I so want one of these. This would be so fun. This is something the kids would really have fun with. I like the sleek design. Yes and it eliminates so many bottles and cans, it is a great way to help the planet. I had never seen one of these. It is fantastic! So many possibilities and so much more eco friendly. We recycle and upcycle items into crafts. I would absolutely love to win one of these! Such an awesome giveaway. My recent post Easter Decoration Made With A Spaghetti Sauce Container! An EASY DIY Mason Jar Craft! My kids have been begging me for one of these for a long time! They would love one of these, I've heard great things about it! I've been meaning to research these if only for the sparkling water option! Yes, you can make many different sparkling beverages with it. SO EASY too. I love my sodastream. I have never thought to make fancy drinks like this with it, I always just make sodas or sparkling water. Gotta try this now. I have the old Soda Stream and I love it! I'm really loving this new look though! Oooh fancy!!! We have a Soda Stream and my hubby uses it all the time. We've had it for years now. That's a really pretty one and I love what you made! Hehe, thanks! Gabby thought she was all fancy using the wine glasses. Hehe. We recycle everything and try to avoid paper goods. Thanks for the opportunity to win such a great prize! I have a big green thumb and plant a garden every year. I try to put plants in my garden that also provides food source for bees and butterflies. One of the best ways to have a beautiful garden – starts with the soil; which means Compost, compost, compost! Turning things back to earth – is one of the best ways to take care of the earth. I love this machine! I saw it in the store the other day and thought what a great, healthier alternative it would be to commercial pop. I too love a sparkling beverage on a hot summer day. freezing blueberries is a great way to add some refreshing coolness. We plan our meals for the week and do freezer cooking on the weekend. That drink looks good, except we don't drink soda in our house, we like to keep it to healthy drinks only.. mostly water. We have a SodaStream that gets a lot of use. I really love this new design though! Ours has had a lot of use. 😀 It is awesome! 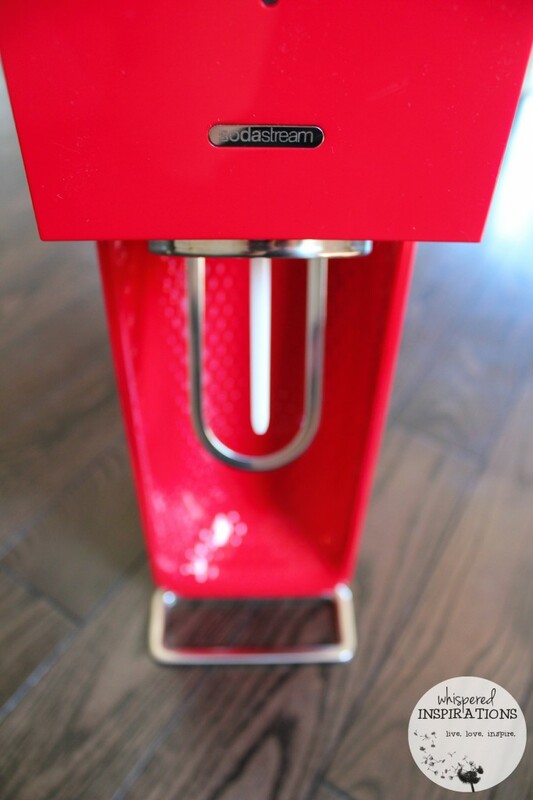 We have an original SodaStream that we love. But, this new design really catches my eye. I need to update my Sodastream! I love that color! I try to have tons of veggies and fruit on hand as my kids will go for that for snacking. We also never have soft drinks in the house. I had no idea this came in red. That looks snazzy! It comes in White, Black, Blue and Red. Snazzy! That looks so refreshing, and easy to use. How adorable is Gabby?!?! Great post. Thank you for sharing. We love our SodaStream too!!! It always makes us feel we are being healthier! I don't have the Source, but we do have a SodaStream and I LOVE it. Not only can I make drinks just the way I like them, it's great for parties because you can easily make small amounts of interesting varieties for guests! Love the outcome! I wanna try this out, thanks for the review girly! We use fabric serviettes/napkins, grow our own lettuce and herbs in the summer. Thanks. That SodaStream looks fab! I buy organic foods, we drink lots of water, we recycle and exercise!! Would love to get one for myself and my son. Teach him sustainability with drinks just as we have started a window herb garden for him to tend. Well, my nest is mostly empty these days, but even when I had kids running around I was very careful about the foods they ate AND what they drank, (no sugary drinks…real fruit juice, 2% Milk, or water) Their snacks were fruits, veggies and nuts and yogurt. We also lived in Florida when they were growing up, so they were very busy doing outdoor things. There were no video games in our home:). We buy a lot of fruits and vegetables to snack on for our family, and try to eat organic when possible! We are going as organic a possible. This would just be an added bonus to use – I'm thinking watermelon & strawberry. Yum! We always offer fresh fruits & veggies for snacks before anything else & they actually prefer those to other things. Cant wait to try it. Trying to find a substitute for drinking Diet Pepsi. I heard this was healthier and safer! We grow all our own herbs in the back yard. Try to always buy organic and compost everything we can. I really want to try one out! I love sparkling water and know I would love to experiment with this! I would love to win! I've really want to get one of these! We recycle weekly to keep glass and plastic out of the landfill. I try to buy and cook organic as much as possible. Okay your daughter is just adorable!! I was just telling my mother about Soda Stream. 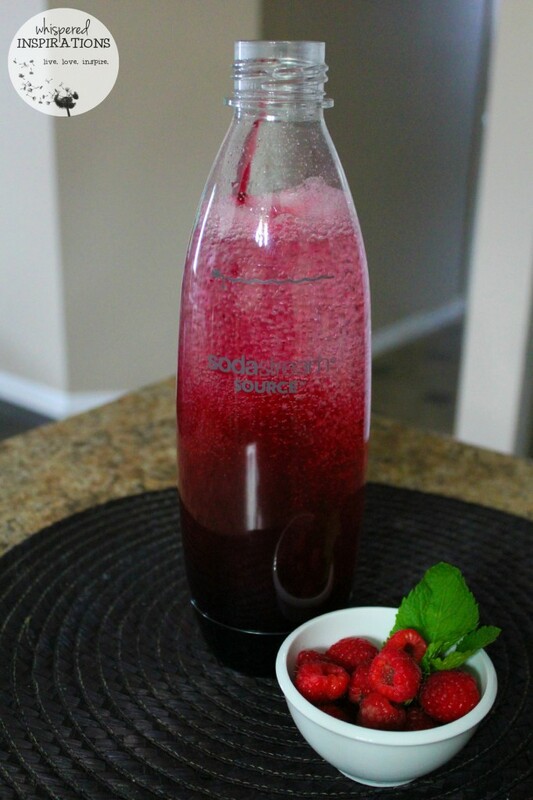 What a great alternative to all those sugary sodas! And saving on all the plastic bottles/waste. Brilliant! Also a super great gift idea!